Have deer been munching on your plants? We have the answer! 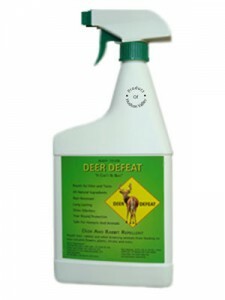 Deer Defeat “It Can’t Be Beat”, all natural, environmentally safe deer, rabbit, and groundhog repellent solution provides a protective barrier to prevent deer and other browsing animals from destroying your flowers, garden, trees, and shrubs, while simultaneously nourishing the plants. Now through July 3, come in and get one 32 oz. Ready to Use Spray FREE when you buy one 16 oz. Concentrate. We are located at 3697 Michigan Avenue Road, across from Antonio’s Restaurant. Directions for Use: Apply liberally to plants during calm weather and at least 4 hours before rainfall. During the plant’s rapid growth stage, reapply weekly or every 6 to 7 inches of new growth, and then monthly thereafter. No need to reapply after rainfall. 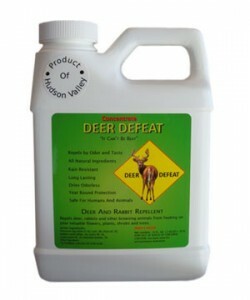 Deer Defeat formula lasts up to 3 months but may be subject to conditions such as the amount of rainfall. For optimal results, spray Deer Defeat once per month.